The wealthy stock dealer bequeaths his Montana farm to the three daughters provided they would live there together at least for a year. A woman who has psychic visions returns to her hometown to exorcise her demons, and finds both danger and love. Detective Reena Hale (Witt) is revisited by the stalker who traumatized her years ago by offing any man she fell in love with. Nate Burns accepts a job as chief of police in Lunacy, Alaska, hoping to to get away from the traumatic death of his partner back in Baltimore. He meets Meg, an independent bush pilot, whose father is found dead in a mountain cave. Expert hostage negotiator Lieutenant Phoebe McNamara juggles her high-pressure career with the demands of raising her young daughter and contending with her agoraphobic mother, Essie. A former child star buys her grandmother's house to rescue it from ruin but her hope for serenity is soon eclipsed by haunting dreams of her famous grandmother, who died of a supposed overdose in the house more than 30 years ago. World famous violinist Caroline Waverly returns to her home town of Innocence to retreat from the world. But a serial slayer is stalking the streets of Innocence, and Caroline may be a prime target for murder. Aimie Roarke is always up for a cause, whether it's helping a local animal shelter or hosting a bake sale for the Fire Department. When the town's beloved oak tree is set to be cut down, she takes it upon herself try and save it. Tess: Jack teach you all this stuff? Willa: Ya between his benders... be glad you're the one that got away. Tess: Ya well, you're the one he kept. 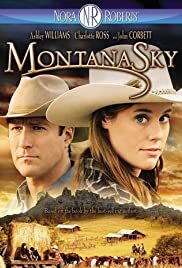 Montana Sky opens with the death of the family patriarch, a man named Mercy who like Ben Cartwright fathered three children legitimately, except in his case it was daughters instead of sons. But a role model like Lorne Greene this guy wasn't. One daughter Ashley Williams stayed home and learned the ranch business. The other two were from trophy wives, Charlotte Ross and Laura Mennell. Ross is a screenwriter and Mennell is hoping to escape from a batterer whom she married. For the zillionth time an eccentric will is the thing the plot turns on. The estate after a couple of cash bequests is worth 24 million dollars and the half sisters who don't know each other have to live and work the ranch for a year for any of them to inherit any of it. Eight million dollars is a mighty powerful argument to induce the sisters especially Ross to stay and make a go of it. Poor Mennell just wants to find refuge. There's also someone slaughtering animals in a particularly sadistic way on the place. It could be Mennell's ex-husband Scott Heindl or maybe someone else also has a grudge. I have to say that the three women had some nice chemistry between them or otherwise Montana Sky would not have worked. The vast western vistas are really something, better than the mostly studio based photography on Bonanza. Ross especially impressed me as she essayed a character who saw some considerable growth in character over the course of the story. That's worth seeing Montana Sky in and of itself.